At Beachcomber Lethbridge, we pride ourselves in assisting you in achieving beautiful, sparkling water that will bring joy, therapy, romance and relaxation to your hot tub. 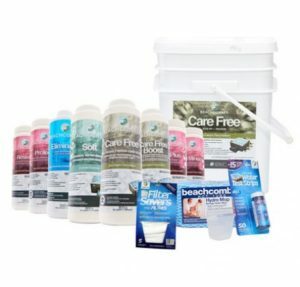 Our hot tub chemicals and water care products are uniquely designed to be simple and easy to use that will help you achieve great water chemistry. To help you on the path to achieve crystal clear water and luxurious soaking, we encourage you to bring in a sample of your water on a monthly basis or even more often if you wish. Our Water Care Specialists will provide you with a FREE custom computer analysis and treatment recommendations. We also stock a variety of test kits to help you with daily testing at home. There are a number of options to suit each individual and their specific needs. Mineraluxe – a newer system using mineral based products to sanitize and balance your water. 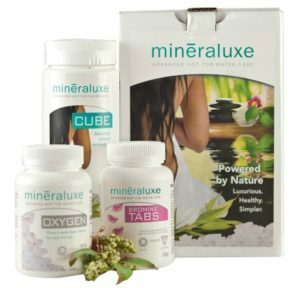 Click here for more information on the Mineraluxe system. Come in today to have one of our Water Care Specialists help you get set up on the best program for your family. For Water Care Tips, follow the Blog on this website or our Facebook page. You can also check out the Water Care FAQ page for solutions to common water care issues.